As Energy Vortex comes into play, choose an opponent. At the beginning of your upkeep, remove all energy counters from Energy Vortex. 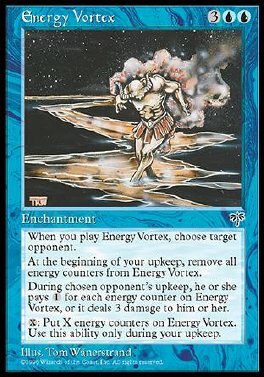 At the beginning of the chosen player's upkeep, Energy Vortex deals 3 damage to that player unless he or she pays 1 for each energy counter on Energy Vortex. X: Put X energy counters on Energy Vortex. Play this ability only during your upkeep.